I haven’t written very much yet about our Accessible Garden area because it was still in the process of getting underway. This area is being cared for by residents of Via Christi Village on Ridge and the Master Gardener Horticulture Therapy Committee. 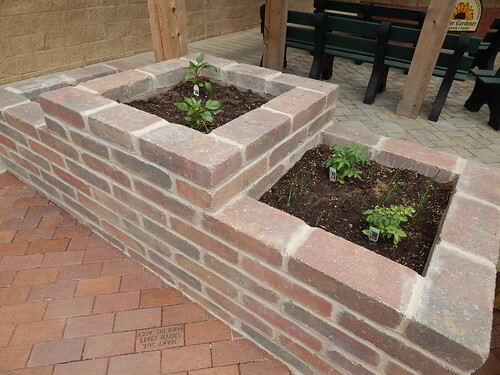 This area has the tiered raised bed and several smaller planters. Here’s the map for the tiered raised bed. The tomato varieties are both super compact container type tomatoes. One of the residents really wanted to have a cantaloupe, so they are going to be growing the ‘Honey Bun’ variety that we tried a few years ago. Here’s what that raised bed looks like right now. The shorter tiers are a good height to sit at and the taller one is perfect for standing and gardening. This is the larger of the two barrel planters. Right now it has a couple of potatoes in it as well as the remainder of some spinach. There was spinach in the raised bed until this morning, but it was starting to bolt and was covered in aphids (and ants that were farming the aphids). The spinach in this planter is still looking okay. 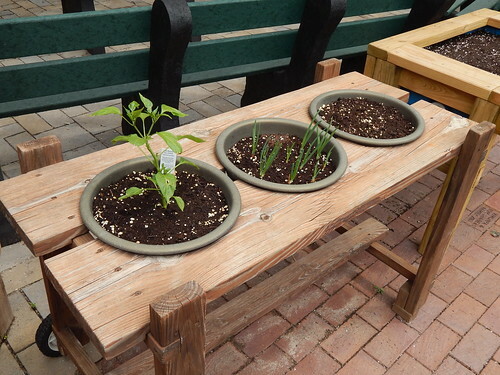 Our wheelchair accessible container garden has a bell pepper and onions planted currently. The third pot will be basil once it is a little bit warmer. 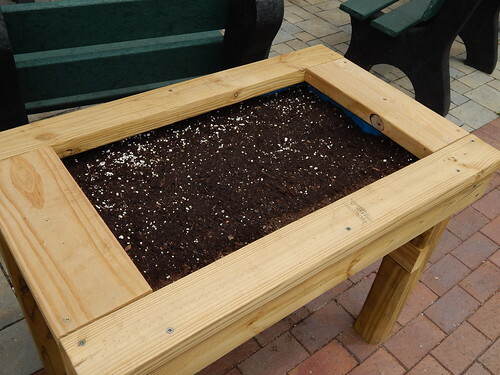 The smaller barrel planter is planted to green beans. I know, it’s not a very “space wise” thing to do, like I preach all the time. But…part of this area is therapeutic, so high yields aren’t necessarily the first priority. I suppose I should have posted this at the top. 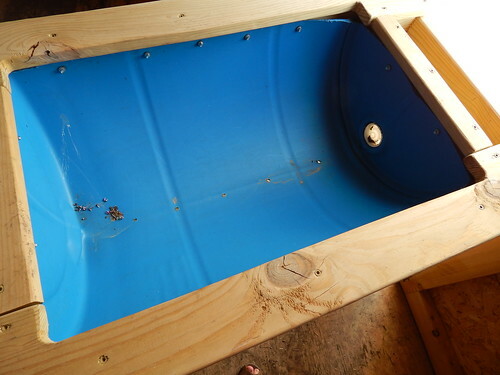 This is what the interior of the barrel planter looks like. 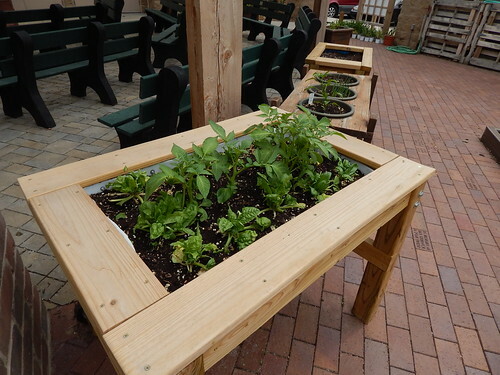 We have a publication that has more details and a plan for building the planters: Wheelchair Accessible Gardening. I’ll keep you updated on this garden area throughout the summer along with the rest of the garden. Posted on May 15, 2013, in Garden Planning, Working in the Garden and tagged accessible gardening, gardening, onions, peppers, planting, potatoes, Tomatoes. Bookmark the permalink. Leave a comment.